Not having to deal with chain maintenance just makes me happy. For the first four days I loved the power that the brakes had, but their binary feel left me a little wary of their ultimate capabilities. I had the occasion to pull a couple of panic stops in different traffic situations, including one rainy stop. The rear-wheel locking in the wet, and need for attentive modulation in the dry had me wondering if there was something wrong. There was something wrong, at least between the seat and the handlebars. 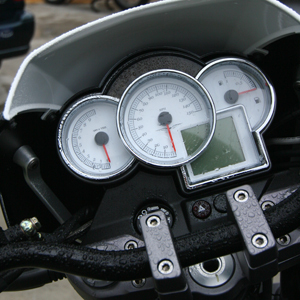 I spent some time fiddling with the adjustable levers, and discovered the eccentric knob on the rear brake lever. I gave the front levers a longer pull, which gave me fingertip control over the front brakes, and rotated the rear lever knob to a higher setting that allowed for more feel under my boot. The difference in the feel, the return to a more progressive action, and the change in my confidence level made the bike a blast to ride in traffic. A final note-nit would be the tires on the test bike. They are Metzlers, and previous riders have obviously just flogged this bike through the Canyons between the Rock Store and Neptune’s Net without mercy. There is no “chicken strip” whatsoever. There are little chunks missing from the rear where they have obviously been overheated. The fronts are not much better, but, after 1500 miles, I would not keep them on my personal bike. They really give me “the willies” over paint stripes; My Diablo Stradas, even when worn out, never have done this. The controls on the handle bars are like all the other new Italian stuff. A Ducati owner would be at home here. The instruments are very readable; white faces on black printing. They have a comfortable red back- light at night. The owner’s manual was missing so I haven’t figured out how to use the double trip odometers, but one delightful item is the hour meter that shows the time vs. distance for each trip. 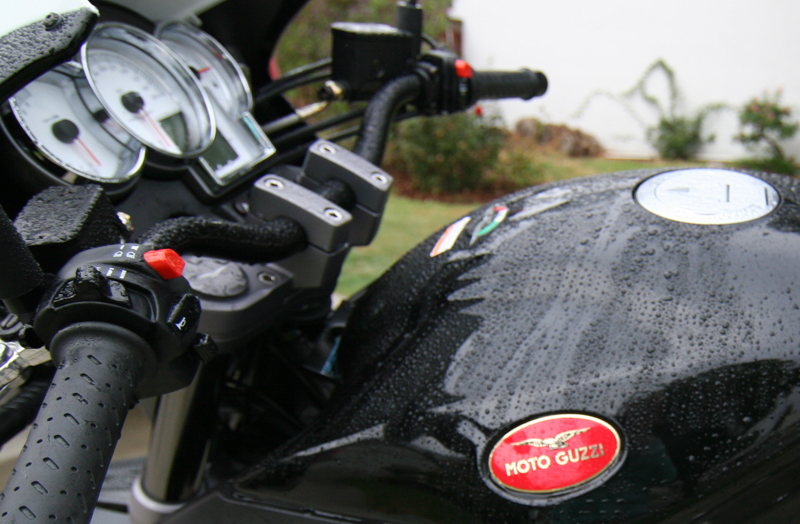 Moto Guzzi has laid out the few digital readouts well, and managed to give a “touch” of retro feel in the idiot light area, but everything is explained and clean. Ambient air temperature display is cool, too. The kickstand and it’s safety blocks are different from my ST2. The ST2’s engine kills whenever the kickstand is deployed. The Moto Guzzi will allow the deployment of the kickstand in Neutral with the engine running, an idiot light showing that it’s deployed. It will not allow you to put it in gear, which is nice. The kickstand itself is substantial although it puts a lot of lean to the bike on level ground. It has a lot of surface area and probably would give an owner confidence on ground that offers at least a modicum of support. I wish it had a center stand. I’d get rid of the slop in the drive train. It requires attention and getting used to when other inputs are more important. I’d make the trip computer a little more intuitive. A few more controls would make it easier to set and manage. I’d also like to see what a narrower back tire would do for the turn-in on the bike, but that may have to do with the tires’ condition. Throw some side bags in. One that will fit my 17″ MacBook. After conversing with some of the dealers, they have all said that the US evaporative pollution gear affects the fuel mixture. I’ve noticed a light backfire when decelerating, indicating some lean-burn, but the overall power and throttle response has been linear, at least during my time with the bike. The dealers have mentioned a “surging” at low speeds that can affect parking lot handling. I only experienced this once at a stop light after running around 70 mph for 15 miles. As soon as the light turned green I accelerated away and never noticed it again. The only issue I had that could be attributable to the Evaporative System was leaving work after the bike had sat in the sun’s 90° heat all day. The bike started but refused to stay running without throttle for about 3 minutes. I popped the gas tank open; it sounded like a beer can. Soon after the bike ran fine like nothing happened. I parked it in the shade today. The Breva 1200 Sport shows itself to be a nice, refined bike. The 1200 engine and it’s associated parts are still new when compared to the 1100 it is replacing. A little more US market development is needed, and the low volume of American sales have probably made this a lower priority over Europe. Not really a big deal, as the dealers here are aware of the issues and have some fixes for them. I don’t have a big issue with MG’s low number of dealerships. Every one of them seem to really WANT to have Moto Guzzi on their floors, and CARE about the brand enough to really do a good job of customer service. The bike itself is such a reliable platform that I wouldn’t worry about being left on the side of the road anyway. More on this experience tomorrow. Not so much a reply as a question. Have they mentioned why they have given this particular bike to you for this test when they reportedly are not going to be bringing the Brevas to North America next year? I hear the V7 Classic will be coming, but apparently not the rest of them. I am really enjoying the blog on this bike. It sounds great! Hope they change their minds on bringing them in. I would love to have one, but I can’t afford it right now. Have to stick with my Breva 750 for a while. But that certainly isn’t all that terrible! It’s a great bike too. It just doesn’t have that lovely rush of acceleration into the triple digit range. It does get 51 mpg though. I’d really like to know what fuel mileage you get with the 1200 Sport. Try to work that in. I’m enjoying your ride, Danilo! Thanks for writing about it. I’m one of the guys from the loopframe list. Is that bike really an 8-valve? It looks like the 4-valve engine in the pics (in comparison to the pics of 8-valve Grissos and Stelvios on the factory web site). Man, given the hardbags on my Breva I couldn’t ever imagine lanesplitting. I’ll be the guy with the Orygun plates creeping along, too chicken to go between cars. Lane splitting with hard luggage on a Breva is fun! Honestly, you’re not as wide as you think you are. 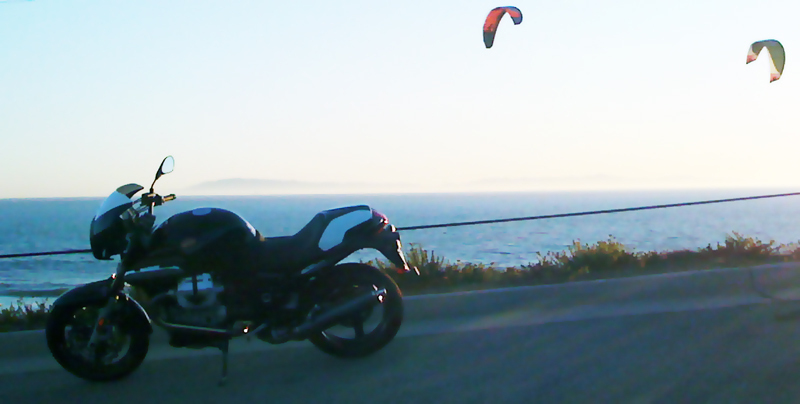 This is one hell of a motorcycle blog, btw. All credit to you. Any ideas of how many 1200 sports were brought into the US in 2008?